This is quite possibly the most charming card trick ever invented! A spectator names any card (no force). You then reveal that the entire deck has little stick-figure magicians drawn on it. Then, to the general delight of all onlookers, the end of the deck is flicked, the cards rush by one at a time, and the drawings become an animated cartoon! 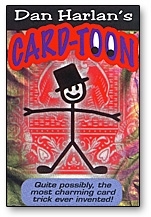 The stick-figure magician pulls a card from his top hat and turns it over to reveal that it is the same card that the spectator named! This can be repeated immediately with any card as many times as you like. It’s one of those rare tricks that’s even more amazing the second time you see it, yet there are no difficult sleights required. This one is a modern classic!